With Quotatis, you can find vetted, reviewed and reliable plumbers quickly. You will also receive at least three quotes for your job and so you can get value for money too. What’s involved in fitting a new sink? Installing a new sink can be as simple as going out buy an exact replacement, where everything else lines up, and all you have to do is turn off water supply, remove the taps, remove the old sink and on the new sink goes. A straight swap is as simple as it goes. A few cosmetic procedures will be required such as sealing the edges with silicone sealant and making the job tidy. Let’s now consider a different scenario, you have decided you need to upgrade your kitchen sink, but instead of a single bowl stainless unit, you want two bowls. 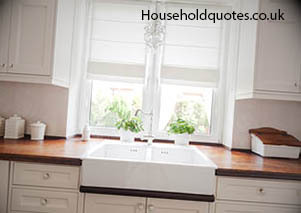 The skill and amount of work to integrate a larger sink into your kitchen becomes more of a challenge. Plumbing a new kitchen sink in this situation is no longer a straightforward job. The price for a simple sink swap including labour and all materials and a new sink (for the purpose of this illustration sink cost is capped at £250), the average cost of installing a new sink would be between £350 and £450. Prices vary across the UK and depending on the size of the plumbing company you engage. One-man businesses have lower overheads and operating costs and may afford lower prices. Keep this in mind when evaluating costs for trade-related jobs. The cost of installing a new sink where some pipework modification may be necessary will cost slightly more. Work involved may include new waste pipes or cutting the worktop to accommodate the new sink. It is always recommended you buy a sink the same size, or larger than the existing one because you can always cut the worktop to size, but you can’t fill in the gaps if you go smaller. Again, capping the sink cost at £250 allows for easier comparison for quotes. You can always purchase the sink yourself and request fitting only prices. For this type of work, the costs for fitting a kitchen sink will average between £375 and £500. Always ensure the tradesman includes the price of disposing of any waste, including the old kitchen sink. With Quotatis you can post a job and tradesmen will provide quotes for you to consider. Find the perfect plumber for your kitchen installation by going to Quotatis today.